On Thursday, June 28 at 6:00 pm, Minnesotans will attend two simultaneous public hearings on proposed wind energy projects in the Southwest Minnesota communities of Canby and Hendricks. The scheduling of two wind farm hearings at the exact same date and time, just 20 miles apart, speaks to the tremendous wind energy growth that is taking place in Southwest Minnesota – growth accelerated by the pending phase-out of federal wind energy production tax credits. The hearings also provide an opportunity to examine the benefits to local communities of wind energy development and how widely these local benefits can vary from project to project. In Hendricks, the public will consider Blazing Star 2 Wind, a 200-megawatt wind farm that will be owned by Xcel Energy and built by Minneapolis-based Mortenson Construction, a contractor that has a decades-long record of building wind energy projects across Minnesota using a largely local workforce. In Canby, the public will consider Bitter Root Wind, a 150-megawatt wind farm that will be built and owned by RES Americas. Based on RES America’s most recent wind energy project in Minnesota, Pleasant Valley Wind, the company relies extensively on non-local workers. Many jobs are at stake in imminent decisions by developers and contractors to hire local or out-of-state workers for wind farm projects. The Blazing Star 2 project is expected to employ between 100 and 140 local workers. 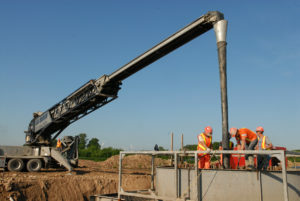 Opportunities may be substantially lower for local residents on the Bitter Root project. An area resident who observed the construction of Pleasant Valley Wind estimates that local workers accounted for less than 10 percent of the workforce. If this assessment is accurate, the number of construction jobs created for local workers on the proposed Bitter Root could be as few as as 15 or 20 jobs. Our recent report, Catching the Wind: The impact of local vs. non-local hiring practices on construction of Minnesota wind farms, found that such differences in the use of local and non-local construction workers can translate into significant differences in local economic impact. Our analysis found that local construction workers are expected to contribute three or four times more to local economic activity than non-local workers, and on a typical 150- or 200-megawatt wind project, the difference between largely local and non-local construction hiring can add up to millions of dollars gained or lost for local economies. 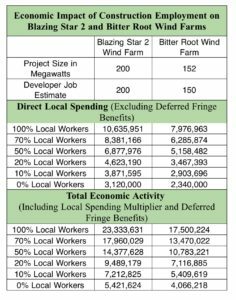 The following table provides an overview of the projected total economic impact generated by both direct and indirect construction worker spending on the Blazing Star 2 and Bitter Root wind farms. Total economic impacts are presented at different levels of local workforce utilization. For a full discussion of the methodology used in the projections, see the full report. Based on interviews with construction workers and others familiar with the projects, it is reasonable to expect that Mortenson Companies will utilize approximately 50-70% local labor on the Blazing Star 2 Wind Farm project, similar to the ratios on Prairie Rose Wind and the company’s other area wind projects. RES Americas may utilize as little as 10% local labor on the Bitter Root Wind Farm based on observations from the company’s Pleasant Valley Wind Farm cited above. If Geronimo Energy and Mortenson uses 50-70% local workers on the Blazing Star 2 project, the total economic impact will be between $14 million and $18 million. Alternatively, if RES Americas uses 10% or even 20% local labor, the projected local economic impact would range from $5 million to $7 million. If RES Americas committed to use 50-70% local labor, the total local economic impact would grow by $6.5 million. In addition to the loss of jobs, relying on non-local construction workers translates into a smaller tax base and the oss of substantial customers for local businesses. This region of Minnesota has historically lagged the rest of the state in construction job creation and overall economic vitality, and needs robust investment in the local workforce and quality jobs. A recent analysis of data from Minnesota’s Department of Employment and Economic Development found that job seekers in Southwestern Minnesota outnumber full-time job openings by a two-to-one ratio, and that many of the available jobs pay low wages and do not offer health benefits. Both the Blazing Star 2 and Bitter Root Wind farm projects provide local benefits beyond the direct and indirect construction employment impacts. For example, the Blazing Star 2 project is expected to generate $900,000 per year in production taxes, $1.3 million a year in landowner payments, and $40,000 a year in contributions to a local community fund. The Bitter Root Wind Farm is estimated to contribute approximately $690,000 in production taxes as well as annual lease payments to local property owners that might be expected to approach $1 million per year. The net local benefit of Bitter Root, however, would be reduced substantially if the project relies on a largely non-local workforce. In terms of the overall impact of the project, the difference in local economic activity associated with use of a 10-20% local workforce versus a 50-70% local workforce would equal seven or more years of of lease payments and nearly 10 years of production taxes. As awareness of these significant economic impacts of local and non-local hiring on wind energy projects grows, so is discussion about advancing policies and strategies to prioritize use of local labor and to ensure greater transparency in reporting on local hiring efforts and results. Encourage collaboration with state-registered apprenticeship programs. Since the publication of the report, wind energy developer Tenaska has committed publicly to local hiring efforts and proposed a local hire reporting requirement for the company’s Nobles 2 wind energy project. If other wind energy companies follow suit, the result could be hundreds of new well-paid jobs and tens of millions of dollars in economic stimulus across Southern Minnesota. Jobs Now Coalition, “Jobs Vacancy Fact Sheet: Only 48 Percent of Southwest Region Job Openings Offer Health Care”, June 2018. Jody Issackson, “Construction on Canby wind project to start in early ’19,” Marshall Independent, June 26, 2018, http://www.marshallindependent.com/news/local-news/2017/12/construction-on-canby-wind-project-to-start-in-early-19/.